Description: From Edgar Allan Poe to Kelly Link, M.R. James to Neil Gaiman, H.H. 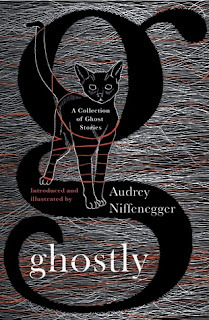 Munro to Audrey Niffenegger herself, Ghostly reveals the evolution of the ghost story genre with tales going back to the eighteenth century and into the modern era, ranging across styles from Gothic Horror to Victorian, stories about haunting--haunted children, animals, houses. Every story is introduced by Audrey Niffenegger, an acclaimed master of the craft, with some words on its background and why she chose to include it. Audrey's own story is "A Secret Life With Cats." I've read The Open Window before and it was pure delight to read again. "we all wonder about death, but we don't understand it. Ghost stories are speculations. little experiments in death"
a tooth in coke, in the morning it will be dissolved into nothing. That's how bad Coke is for you and why you must always clean your teeth, every night." "I'd heard the Coke story as a boy, and had been told, as an adult, that it wasn't true, but was certain that a lie which promoted dental hygiene was a good lie, and I'd let it pass." "Because I can't stop my body and mind waiting, every day, every day, I can't let go."